By Zack Quaintance — With a seemingly-endless supply of comic books that extends back generations, it can be easy to get so lost in graphic sequential stories that one forgets prose novels and non-fiction books are even a thing. It takes discipline (for me, anyway) to keep a few words-only books on hand to balance the time I spend with all those words on top pretty pictures. There are, however, ways to make achieving that balance easier, namely via prose books that have direct connection to the favorite hobby of the comics reader: comics. And that’s what today’s holiday shopping guide is all about—the best prose books to buy for comics readers. On our list today you’ll find a varied selection of non-fiction and fiction, some of which are even written by folks primarily known for their work in comics (at least in the circles of anyone who is reading this). Elsewhere, you will find some historical texts that provide insight into the formation of the comic book medium as we know it in America today. So, dig in, keep and open mind, and find some words to get for the comic-lover in your life. And now onward to our recommendations! This is, simply put, the most comprehensive and well-told historical text about any one publisher, and while it is as the name implies an untold story about Marvel, it also doubles as the best read I’ve found about the founding of Image Comics. Sean Howe is one hell of a reporter and writer, and what he does with this book is essentially bring into focus the entire comics industry for the decades in which Marvel has been the leading player: the ‘60s - the present. Moreover, this story as Howe lays it out is almost Shakespearean in scope, setting up and knocking down plenty of subplots about Marvel in Hollywood, the strained relationships between Stan Lee and collaborators like Steve Ditko and Jack Kirby, and the somewhat chaotic series of events that left Ike Perlmutter largely in control of Marvel’s many properties. This book is an almost-granular dive into the post WWII cultural moment that saw a publisher and other comics folks pulled before a Congressional committee aimed at parsing whether the medium as constituted was corrupting the youth. The prose in this book is also strong and intelligent, although Hajdu’s aesthetic often involves laying out events and facts in a cold way that leaves the absurdity of a given historical moment unstated. Hajdu’s reporting is deep and his interest is perhaps more of that of a historian than a literary writer. Either way, this book is tough to put-down, a must for anyone interested on how comics have evolved within the wider landscape of American culture. There are—to my knowledge—no texts about DC as comprehensive as Sean Howe’s book about Marvel. Chalk this up to the company having a longer and more unweildly history, perhaps. For the DC uber fan, however, it is possible to bundle a couple of books together and get a pretty decent picture of the company’s evolution over the many many decades of its life. What better way to do this than through two of DC’s most iconic characters: Batman and Wonder Woman? In these books, readers will get a sense of what DC was like when the characters were created as well as what has made the publisher able to outlast so many of its competitors. Both Lepore and Weldon are pithy and talented writers too, making for two of the most enjoyable books on today’s list. Do you have a comics reader in your life who also likes to talk about the benefits of things like transcendental meditation? (I count myself in that narrow group, btw)...well then, this one is for you. Superstar comic book writer Grant Morrison (Animal Man, Doom Patrol, The Invisibles, All-Star Superman, etc.) waxes about his childhood, what heroes have meant to society, his extensive body of work, and some of the psychedelic experiences that informed his often-meta approach to the material. This book is a bit lighter on the 20,000-foot view of comics than the others on our list, but in its place it has a set of personal insights from one of the most intricate and unique minds in all of comics. Finally, here are some novels that involve comics or comic creators, or were written by authors who have written comics themselves. This Pulitzer Prize-winning novel is essentially a love letter to the Golden Age, starring a pair of characters who are analogous to Superman creators Jerry Siegel and Joe Shuster. A stunning and deep novel, this celebrated novel is for the serious literary reader on your list. 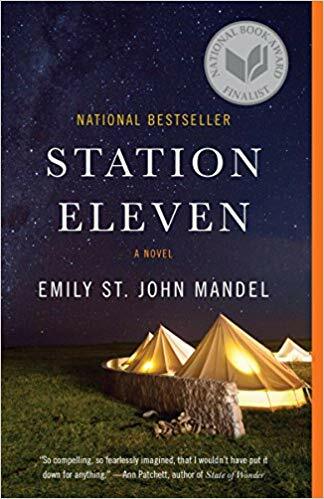 Emily St. John Mandel’s forlorn 2014 science fiction novel follows a group of characters who survive an apocalyptic epidemic that leaves the world sparse and regressive. With scenes set before, during and long after the outbreak, this novel is one of the best pieces of near-future dystopian fiction to emerge in recent years. One of its plot threads involves a graphic novelist, whose independent science fiction comic survives the apocalypse, remaining the treasured possession of one of the characters. The story is such that it could be a comic itself, and, even better, a physical comic book plays a key role in it. Mat Johnson is the writer of literary comics such as Incognegro. In this novel about a hippie school in a public park for mixed-race students, the main character is a comic book creator and former retailer. This is a story that all current and former Wednesday warriors will likely relate to: there are love scenes wherein a couple go to the shop together and lay entwined as they browse through the week’s stack. Ben Percy has written superhero titles such as Nightwing and Green Arrow, but one of his first dalliances in comics involved pitching Red Moon as a creator-owned comic. While that never came to pass, Percy went on to tell his werewolf terrorism story as a rapid-fire and suspenseful novel, one that should be of interest to fans of Stephen King. This short story collection pre-dates the time Scott Snyder (now a superstar DC Comics writer) has spent writing comics, but one can see his propensity for big ideas within them. At the heart of this story, however, is a young man’s fear of responsibility and commitment...something I reckon a good number of comic book readers (and just human beings in general) will relate to.